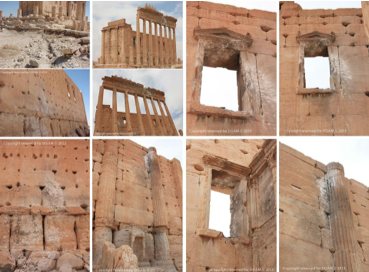 Before-and-after photos from the AAAS show the extent of damage to Syria’s World Heritage sites as a result of the war. Syria is home to six World Heritage sites: the Ancient City of Aleppo, the Ancient City of Bosra, the Ancient City of Damascus, the Ancient Site of Palmyra, the Ancient Cities of Northern Syria, and Krak des Chevaliers and Qal’at Salah el-Din. 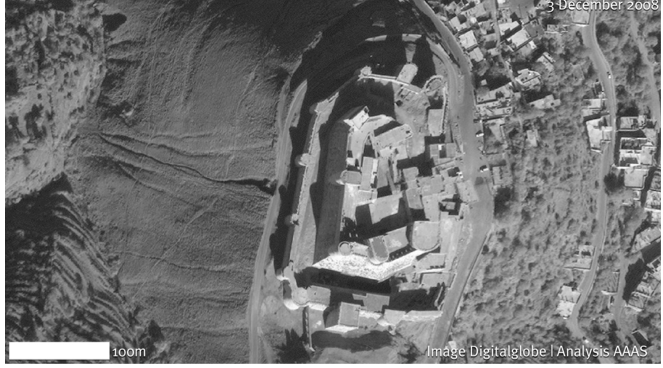 The American Association for the Advancement of Science (AAAS) teamed up with the Smithsonian Institution and the University of Pennsylvania Museum of Archaeology and Anthropology’s Penn Cultural Heritage Center (PennCHC), and in cooperation with the Syrian Heritage Task force, undertook an assessment of the targeting and destruction of Syria’s World Heritage sites using high-resolution satellite imagery. 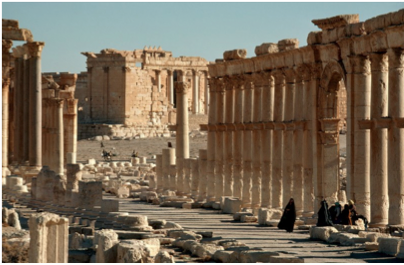 Syria’s ancient cities, castles, ruins and archaeological treasures are now among the casualties of war in Syria. A heritage that spans over 5,000 years is more or less being buried underneath the rubble. 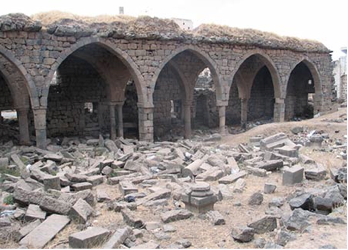 “Damage and targeting of cultural heritage is a human-rights concern. 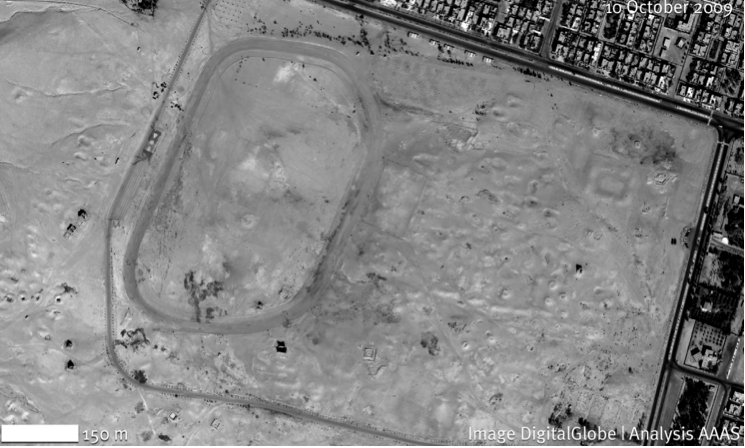 It is extremely important to document the large-scale destruction in Syria,” Susan Wolfinbarger, director of the Geospatial Technologies and Human Rights Project at the AAAS, told Syria Deeply. Shelling, shooting, looting and bombing are the major causes of damage and destruction, but the sites have also come under physical strain as they have become housing for Syria’s displaced. 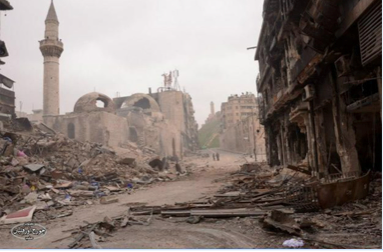 These before and after pictures below show the Syria that existed in history books and the collective memory of its people, and the shocking devastation and damage done. The continued damage of these sites increases the loss of a common Syrian heritage and cultural legacies that carry global importance. 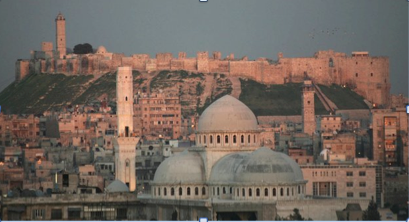 Aleppo is one of the oldest continuously inhabited cities in the world. Located at the crossroads of several trade routes since 2000 B.C., its Citadel, Great Mosque and various 16th- and 17th-century buildings all form part of the city’s urban fabric. Unfortunately, the city of Aleppo has experienced some of the heaviest fighting of the Syrian conflict. “Aleppo is the worst case of all of the sites in terms of the extent and severity of the damage because of continuous bombardment. It is important to know that it is not occasional damage to Aleppo; it is ongoing and continuous. There is fighting on the ground across the whole city, many cases of barrel bombs being dropped on the city, and reports of tunnel bombs,” said Wolfinbarger. 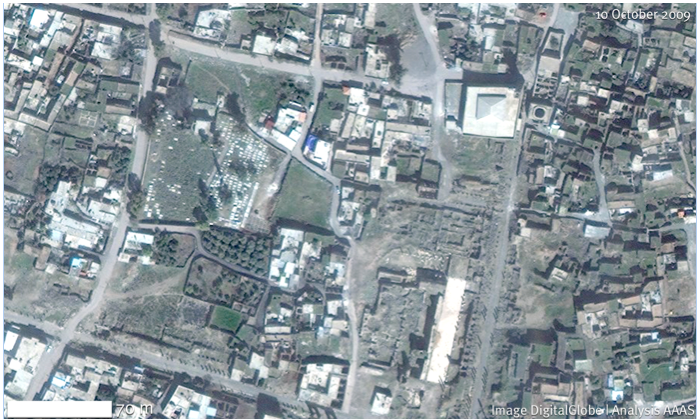 Between December 6, 2011 (top) and July 14, 2014 (bottom), the east wall of the Kahn Qurt Bey caravanserai, a historic site dating to the end of the 15th century, was demolished (blue arrow). This area north of the Aleppo citadel contains buildings dating from the late Mamluk period (13th-16th centuries) to the late Ottoman period (19th century). 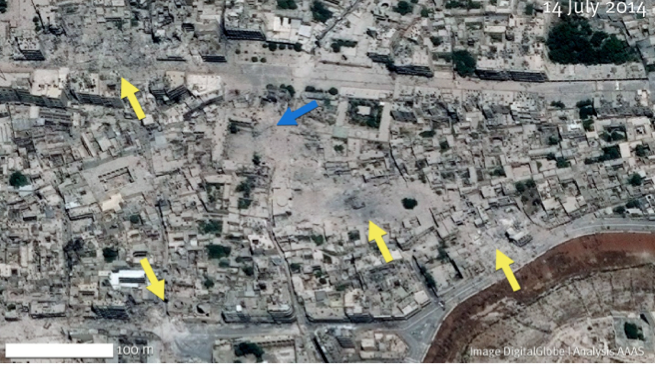 In addition, most of the structures in the neighborhood immediately east of the caravanserai have been completely destroyed and nearby structures heavily damaged (yellow arrows). 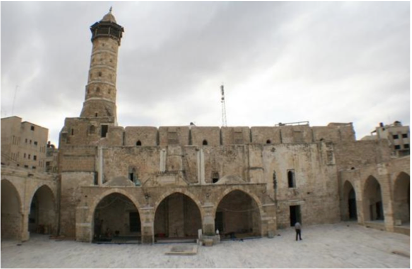 The minaret of the Great Mosque of Aleppo was reportedly also destroyed during fighting in the spring of 2013. 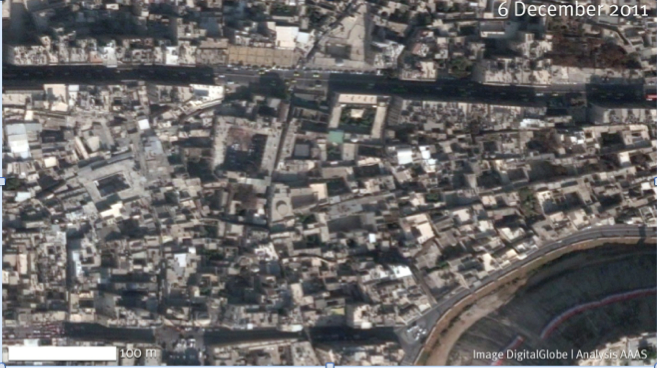 “Since that time, two additional craters have appeared along the eastern wall of the mosque, and the nearby Suq al-Madina was also heavily damaged,” according to the AAAS report. Located in the Daraa governorate, the ancient city of Bosra has remains from the Roman, Byzantine and early Islamic periods. Between October 2009 and April 2014, a number of probable shell craters associated with structural damage have appeared in the Bosra World Heritage site (yellow arrows). These include a hole in the roof of the al-Omari Mosque (AD 720). A probable shell crater is also present in the standing ancient Roman ruins. Signs of conflict and ground presence were evident in imagery of Bosra and included phenomena such as roadblocks, destroyed buildings and earthen fortifications that could be used for military staging and the movement of materials. Palmyra’s monumental Greco-Roman and Persian ruins were one of the major tourist attractions in Syria prior to the present conflict. The Ancient Site of Palmyra and its surrounding archaeological area have all sustained significant damage, “as it has been caught in the middle of intense firefights accompanied by extensive military occupation.Throughout 2013, the Syrian military forces ramped up their efforts to control the area and used the site to house its equipment. Reports indicated the presence of rocket launchers and tanks inside the archaeological site,” according to the AAAS report. 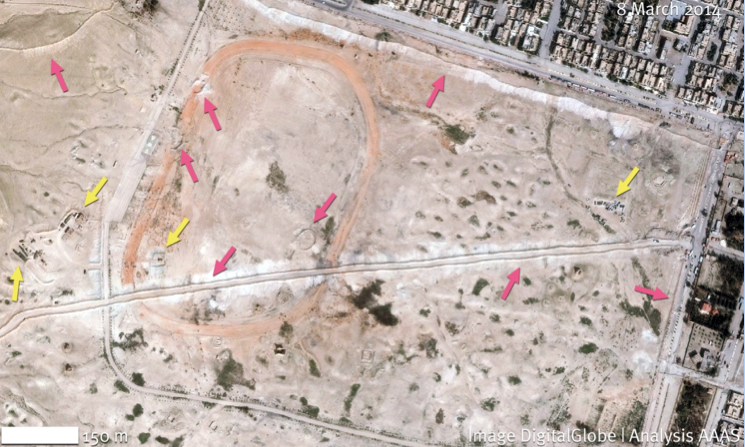 Between October 10, 2009 (top) and March 8, 2014 (bottom), the northern section of the Palmyra Archaeological Park was disrupted by the construction of a new road traversing the site, and numerous earthen berms (pink arrows), many of which are being used to provide cover for military vehicles in fortified positions (yellow arrows). 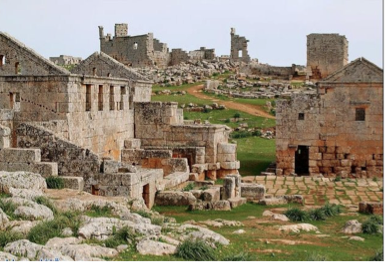 The Ancient Villages of Northern Syria, also known as the “Dead Cities,” are archaeological parks with standing archaeological ruins that date primarily to the Late Antique and Byzantine periods – the 1st to 7th centuries. This cultural heritage site is comprised of eight parks and these include 40 individual village sites. The Dead Cities are at risk because of their proximity to contested areas, such as Bab al-Hawa, a major border crossing between Syria and Turkey that also serves as an entry point for supplies to armed combatants in Syria. “The World Heritage archaeological parks in this region have been broadly reported to be housing IDPs as well as armed combatants. Conflict in Aleppo intensified, IDPs and rebel groups have passed through or set up camp in the archaeological park,” according to the report. Inside the archaeological park of Jebel Barisha, three compounds were constructed between July 7, 2011 (left) and August 10, 2014 (right). 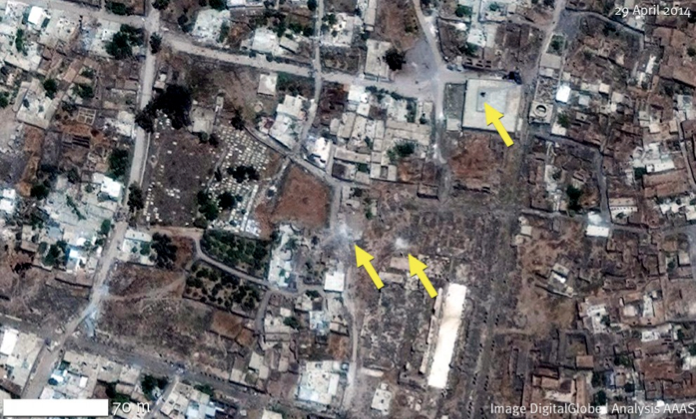 The northern compound contained rows of tents, while heavy vehicles were observed at the southern two compounds and an armored vehicle was present on August 10, 2014 (yellow square). Krak des Chevaliers, also known as Qal’at al-Hosn, is a crusader castle that originally dates to the 11th century. The castles are in key defensive areas and represent the best-preserved examples of crusader fortification architecture. “As early as May 2012, there were reports of gunmen at the castle. By July 2012, Free Syrian Army fighters were reported to be using the site, and, in response, the Syrian military shelled the castle, including the historic chapel. 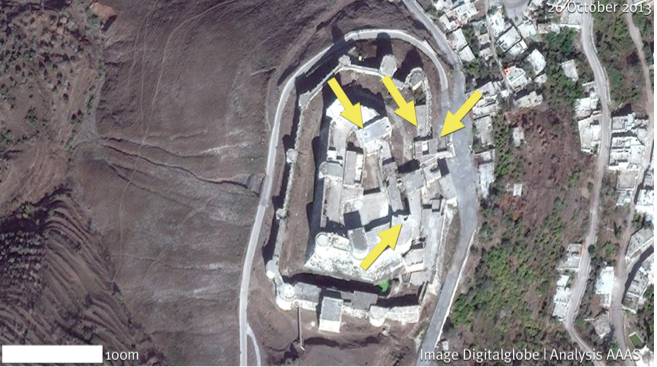 Airstrikes on Krak des Chevaliers were reported in January 2013, May 2013, July 2013 and March 2014, and the shelling continued and intensified until the World Heritage site was captured by government military forces on 20 March 2014,” according to the report. Between 2008 and 2013, a number of craters (yellow arrows) have appeared, one of which appears to have breached the roof of the south turret. More satellite images and analysis are available at the American Association for the Advancement of Science report page.